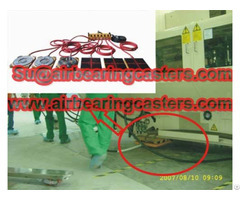 Until now the capacity of this Heavy duty air caster rigging systems is as follow:10 tons, (22, 000 LBS) air skate, 16 tons (35, 200 LBS) air moving system. 20 tons (44, 000 LBS) air load moving device, 32 tons (70, 400 LBS) air load roller skate, 48 tons (105, 600LBS) air load moving skate. 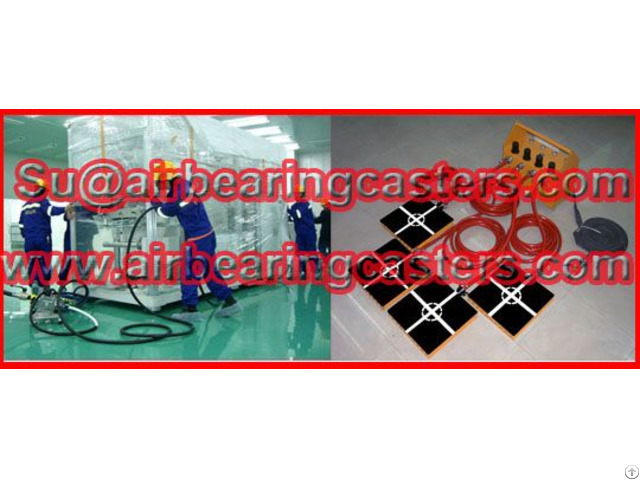 Air bearing and caster via compressed air as power, then can move heavy equipment easily. 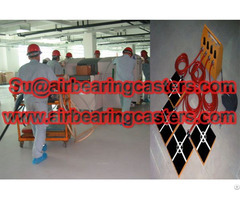 Air skate can let the load float on the film of air, virtually friction freely. So, it is very flexible to relocation or move your devices. 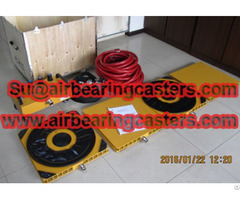 Regarding how to use the air skate, and what area can be used this air bearing and casters, or the air skates price list, please feel free contact us. We will do our best to get your satisfaction.